NAR's Algoritham Bronzer - So I had been eyeing up this for a while after seeing it a lot on social media websites, the design of the packaging is so beautiful and I knew that I wanted/needed it in my life. 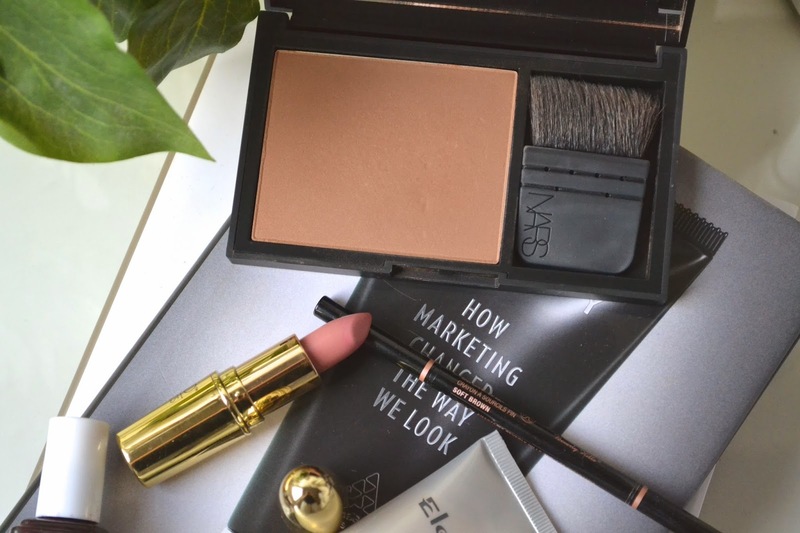 It's basically the Nars Laguna bronzer in really gorgeous packaging and as my Laguna bronzer ran out earlier in the month I thought that I could justify the purchase (kind of). The best bit other than the design and incredible bronzer is the mini ita brush that you get inside. I wanted to buy the Nars Ita brush for ages but it's just so expensive so the fact that it came with the bronzer was an absolute bonus. I've been using it every day and love it to pieces! Anastasia Brow Wiz in 'Soft Brown' - I've been using this raved about eyebrow pencil for over a month now, and yes it truly is one of the best eyebrow pencils out there. The spoolie itself is incredible and it's so easy to get such natural full brows with it! The thin nib of the retractable pencil makes it so easy to replicate the look of hairs and makes filling my eyebrows in a quick and simple process. Gerard Cosmetics Lipstick in 'Buttercup' - This lipstick has been living in my handbag this month as I've been wearing it almost every day. It's such a nice wash of pink on the lips and makes a difference to the darker nudes I normally wear! Elemis Papaya Enzyme Peel - I love the smell of this and when my skin needs a treat I always gravitate towards it. It leaves the skin looking fresh and feeling so smooth. I tend to get a lot of dry skin around my nose area and have found that this works really well to reduce it. Essie Nail Varnish in 'Wicked' - I tend to gravitate towards dark nails, especially in the colder months and this is the varnish that I've been obsessed with for the majority of this month. Essie always has the nicest nail varnishes and they apply so easily and last on the nails for ages. 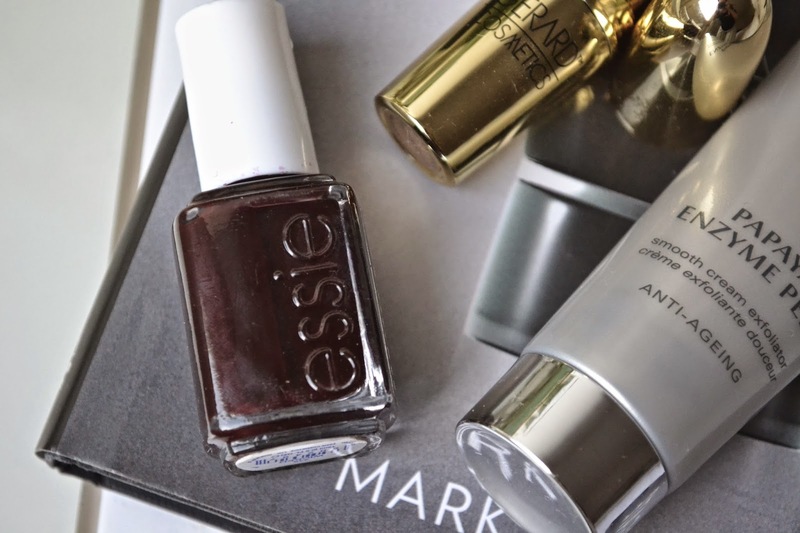 Love the look of that Essie nail polish! 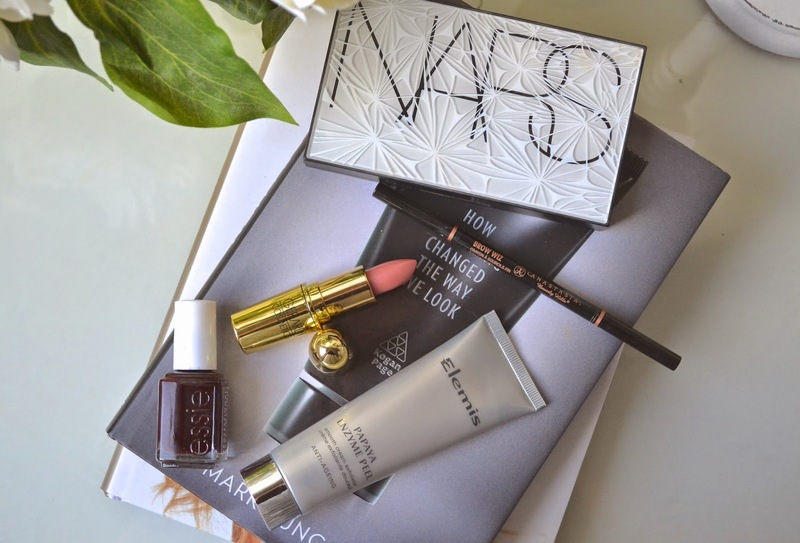 That NARS packaging though!! GORGEOUS!